On Saturday 31/August 2002 I travelled to Melbourne, Australia.,with my son Austin. There we stayed in the Ibis Hotel for three days, taking in many of Melbourne's sites. We spent some time with my aunt Nancy Alter, formerly Nancy Sheils from Johnstown Navan. After that we hired a car and travelled around the country putting 6656 miles on the clock. When we returned to Melbourne three weeks later we stayed with Nancy's son Brendan and his wife Irene. As you can imagine we passed through many towns, including:Kulgera, Woomera, Renner Springs, Adelaide, Tennant's Creek, Darwin, Sidney, Albury, Gunning, Beechworth ( Kelly Country ), Cooper Pedy and those whose names I cant remember. There is however one which sticks in my mind and that is Gundagai in New South Wales. It was a beautiful morning and we had just left the Hume Highway and crossed over Morley's Creek on our way into Gundagai. As we drove across the small concrete bridge I noticed a park to my left. I stopped the car and went in to stretch my legs. There was a monument in the park with the inscription which read, '' In memory of Yarri Hero of Gundagai . Near this site on the night of 24th June 1852 an Aborigine man named Yarri, rescued 49 people from the flooded Murrumbidgee River''. I was intrigued by the inscription and wondered how he managed to rescue so many. We moved further in to the town and stopped at the Cenotaph in Sheridan Street which was erected in memory of those who lost their lives in the Great War. There was a sign close by pointing to the old railway station which is the longest wooden railway station in New South Wales, so we paid it a visit. On arrival we saw a couple taking photos, they were obviously tourists like ourselves. We parked the car and walked around the station. When we moved out on to the platform, we could see that the rail track was overgrown with weeds. It obviously hadn't been used in years. I strolled around the platform enjoying the scene but all the time Yarry was on my mind, how did he save so many people?. I came to a window and saw a man sitting inside at a table. When he caught sight of me he immediately leaped from the table with a cup of tea in one hand and a sandwich in the other. He moved so fast that I thought! what the Hell's wrong am I trespassing?. He came out and introduced himself explaining that he was a guide and that he came from Wales 40 years earlier and settled in Australia. He went on to explain that the line closed down in 1984 and a group of towns people got together and formed a committee. They hoped to get the rail company to run a few trains per year to the town. I commended him on their efforts and said I thought it was a great idea. I told him that I came from Ireland and we both spoke about our respective countries and all the time Yarri was on my mind. When I got the chance, I said to him, '' when I crossed Morley's Creek at the edge of town, I noticed a monument to the memory of an Aborigine named Yarri, who during the great flood of 1852 saved the lives of 49 people, how did he manage that?. He answered like this, pleasant at first, '' when the official search party pulled out, Yarri who had a canoe of his own continued searching saving 49 people, but! the monument doesn't say anything about the white men who saved his people, if you can prove your grandfather was an Aborigine you'll get concessions!!! I was dumbfounded by his reaction and fought hard to hold my tongue. I simply looked at the ground, then glanced at Austin and I knew that we were both on the same wavelength. I said a quick good bye and left. As I drove out of town past Yarry's memorial and drove across the concrete bridge I could see that it was called Yarry's Bridge and I thought, I should have said something, I should have gave him a mouthful, I should have told him the Aborigines didn't come from Wales. YARRI was later baptised into the Roman Catholic faith, taking the European name, James McDonnell. On his death, he was buried in the Catholic Section of the North Gundagai Cemetery on 25th July 1880, but the precise location of his grave is unknown. Pictures and historical content from the Wikipedia free encyclopedia. Delighted to get your comment about the war poems. If you've got the photos and material you should write up your Polish visit. Or anything about Kelly Country in Aussie land. Waylon Jennings had a good song about him in the film. Michael, I live in Gundagai but am not suprised that comment you allege was made, may have been. Many here go on like that and it results in the town presenting as stupid but also denies visiotrs a decent experience here. Some people here imagine that visitors to the town are all dumb so anyone can tell them anything. 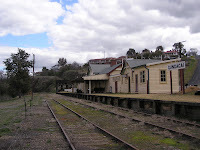 Gundagai is also a major Indigenous site with parts of that on the AIHMS Register. I am not Indigenous but have been working on the real story of the place for a lot of years (for my own interest) as I knew stuff from when my family first came here that had since been hidden. My greatgrandparents were caught in the 1852 Gundagai flood. As far as I am aware, contrary to that ridiculous fairy story told by whoever told you that, there were no white rescuers. All here then were so caught in the flood and those on the other side of it were powerless to do much as they had no boats or anything to rescue peopel with. It was a horiffic time and its not for relatively new people to the town (or nation) to be using the event as an excuse to sling mud at Indigenous people. Many white Gundagarians would not have survived that flood if they were not saved by Indigenous people. Yarri went out in his canoe saving people and so too did Jacky Jacky who was also Indigenous and Long Jimmy and one other Aboriginal man assisted. I am sorry you were spoken to in such an ignorant manner when you came to Gundagai. Come back again and find someone with more manners to show you sites here. There is some amazing stuff here and a lot of it is hidden, along with hidden and/or totally absent manners and a few other things. (Great granddaughter of Maryanne and Sam True - former residents of the Old Gundagai site circa 1849-1856). Thank you for your comment. However I don't know what you're aiming at when you refer to that ridiculous fairy story told to me by someone that there was no white rescuers. I spoke about Yarri because the monument was erected to his memory and it was the derogatory comments spoken by the guide against Yarri and his people which prompted me to write. If you read the article again you will see that nowhere do I say that there was no white rescuers. I did refer to the guide saying that when the official search party pulled out Yarri carried on in his own canoe. I wish you all the best in your quest to write ( The Real Story ) I believe you will come to realize that mine is not a Fairy Story. Michael, what are you on about? It was the deragatory comments I was referring to too. You have got it all upside down. There were NO white rescuers at the time of the flood. There were attempts made the next day to locate people. The fairy story you were told was the deragatory comments re Indigenous people when Gundagai is one of their major major sites. You would not have known that when you were here and the person telling you the story of Gundagai is/was a relative newcomer so they'd not know or liekly tell you even if they did know threads of it. I'd likely know 20000% more about it than you so do know what I am talking about. Thank you for your comment it is most welcome and I agree with what you say. The guide was the wrong man in the wrong job. Perhaps you and I will cause the guides to be more thoughtful in future. Could you please send me your mailing address. I would like to send you a copy of my book. I won't publish your address here.